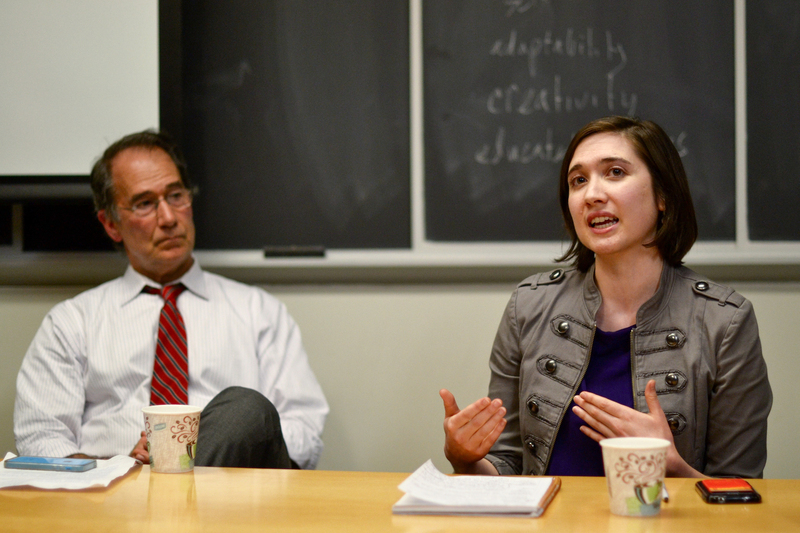 On Wednesday, March 31, the Allbritton Center for the Study of Public Life hosted the third and final panel in a series of lectures about the Syrian refugee crisis. Titled “The U.S. Response, Locally and Nationally,” the discussion was moderated by Assistant Professor of Government Ioana Emy Matesan and included panel members Ben Florsheim, a 2014 alumnus and outreach coordinator for Senator Chris Murphy; Jen Smyers, Director of Policy and Advocacy at Church World Service; Chris George, Director of Integrated Refugee and Immigrant Services (IRIS); and Christina Pope of Welcoming America. The panel began with a video message from U.S. Senator of Connecticut Chris Murphy. Murphy described the poor living conditions he witnessed during his visit to the largest Syrian refugee camp in Jordan. Murphy dismissed the mythology and rhetoric used to justify a closed border policy. He warned that anti-Muslim sentiment only ghettoizes communities and weakens national security. The U.S. must welcome refugees in order to fight global terrorism. Florsheim elaborated upon Murphy’s message and described how public opinion affects a senator’s decision making. “When members of Congress are responding to these issues [such as the Syrian refugee crisis], they are counting letters and phone calls,” Florsheim said. Florsheim recalled the letters and phone calls that flooded Murphy’s office after the Paris attacks. “These were overwhelmingly calls from our constituents to close the borders, to stop accepting Syrian refugees or refugees from any other countries that have a majority Muslim population,” Florsheim said. Florsheim encouraged citizens to call the senator’s office so that pro-refugee support is heard. He warned that even though Murphy is an advocate for Syrian refugees, his policies must reflect the desires of the population he represents. Smyers spoke next, who gave the perspective of someone working with local and national policymakers to improve assistance for refugees resettled to the U.S., and provided context for the global refugee crisis. She said that there are 4.8 million Syrian refugees, and 8 million Syrians who are internally displaced and seeking protection. The Syrian crisis is the largest in the world, but refugees of other nationalities should not be overlooked. There are 60 million displaced people, 20 million of whom officially count as refugees. Smyers discussed three possible solutions for those who have become refugees. First, when and if it is safe, refugees will return to their country of origin. Second, however, if refugees cannot go home, they will be resettled in a nearby country with the same culture or language. Third, and only as a last resort, refugees will be resettled in a distant and unfamiliar country. Symers said that less than one percent of refugees have this third possibility. Smyers then critiqued the European and U.S.’s response to the crisis. Even though the Syrian war has continued for five years, there was no “refugee crisis” until a few months ago. “We only call it a crisis when it inconveniences white, privileged, developed countries,” Smyers said. Despite legal documents requiring many countries to help refugees, fatigued empathy has caused a decline in government responsibility and solidarity among many peoples. The world’s poorest countries are hosting the vast majority of refugees, while the richest countries are deporting and detaining refugees. For example, in Greece, loud speakers shout at the border to deter immigrants, and Germany proposed policies requiring refugees to be German-speaking. According to Smyers, the U.S. has resettled less than 5,000 Syrian refugees in the last five years, while Canada has resettled over 25,000 Syrian refugees in the last five months. Smyers blamed the U.S.’s weak response on the popular belief that refugees are terrorists. In conclusion, Smyers encouraged citizens to correct misperceptions, to prove America is a welcoming nation, and to be an ally in solidarity with refugees. Next, George described the resettlement process for refugee families coming to the U.S. When a family passes the intensive, two-year interview process and a health exam, they are randomly assigned to live in a state. Refugees who are sent to Connecticut will work with the IRIS office in New Haven. George said that IRIS will receive an email about two weeks before a refugee family arrives. IRIS must then find an apartment, furnish the apartment, stock the kitchen, and find someone who can cook a culturally appropriate hot meal on arrival day. After arrival, IRIS helps to enroll the children in school, find jobs for parents, and connect them to healthcare. IRIS must work quickly since money is limited, and families must become self-sufficient. George said that most often, parents are successful in their jobs and children do well in school. Despite IRIS’s resettlement success, the current political climate has rendered the process controversial. Despite the controversy, there are many things that members of the Middletown and University community can do. For example, University students from the Wesleyan Refugee Project go to the IRIS office two nights per week to help register refugees for subsidized housing and energy assistance. Students and members of the community can also donate furniture, set up apartments, tutor families in English, and help with homework. George hopes that Connecticut’s successful program will set a precedent for the rest of the country. Pope then discussed how communities can be more welcoming to new Americans. She said that emphasis is usually placed on how refugees can adapt to their new home, rather than how the new community can adapt for the refugees. “If we think about immigrants and refugees as a seed that is getting planted in the soil, we want that soil to be fertile,” Pope said. Pope described a three-pronged approach to help communities be more welcoming to refugees. First came contact-building. “In order for people to understand each other, especially when there are great differences in their histories and their backgrounds, people need to have meaningful contact with each other,” Pope said. Second came positive messaging. Certain phrases such as “we’re all stronger together” and “a rising tide lifts all boats” make people more eager to help refugees. Thirdly, strong leadership is necessary. A pro-refugee mayor or university president can effectively combat common myths about and perceptions of refugees sustained by anti-refugee political leaders and the media. Pope concluded with advice for communities. “Our advice to communities is that you need to be proactive to help people understand change and create some sort of belonging,” Pope said. John E. Andrus Professor of Sociology and organizer of the three panels Rob Rosenthal gave his concluding thoughts about the challenges and optimism displayed during the panel series. Rosenthal also reflected on how successful the panels were in providing a space for discussion on this issue at the University. I think Senator Murphy should house a half dozen Syrian male refugees in his various homes if he feels so strongly about it. On the other hand I think we should take in one Syrian refugee that each of the wealthy Gulf State Arab states take in. So if Qatar or Saudi Arabia – both devout practitioners of the religion of compassion and tolerance – each take in ten refugees than we should match them one-for-one. It’s a safe bet we would take in zero refugees under this proposal. And it begs the question: Why should we be stuck always bailing Muslims out for their own dysfunction? I would be all for it if they appreciated our values (yes, and that includes charity), but instead, and as Europe knows all too well, they come here and expect hand-outs and for us to submit to their values including the barbaric and cruel Sharia law. Let’s let Hindus, Hispanics, Buddhists, Syrian Christians into our country but not a people who practice a religion that is antithetical to everything we value and embrace.